The Week 11 report is pretty light, thanks to six teams on bye and the big Monday night showdown between the Rams and Chiefs still to come. If you were struggling to find points this week, join the crowd or hope you've still got your studs to come Monday night. Drew Brees continued his MVP campaign with another monster performance, going over 360 yards with 4 TDs in a blowout win. Cam Newton left with an injury but came back to put up 350 yards and a trio of scores. Andrew Luck had 3 TDs for a seventh straight game, just the third QB in NFL history to do that in one season and the other two won the MVP and set the passing TD record in a season. If you didn't play one of the QBs above, you probably left Week 11 disappointed. Carson Wentz was the week's biggest dud, with just 156 yards, 3 picks, and no scores in a shootout gone awry with the Saints. The Fitzmagic show is over again as Ryan Fitzpatrick threw three interceptions without a TD and got benched. Matt Ryan, Deshaun Watson, and Matt Stafford all disappointed relatively speaking, but at least they each scored a TD. If you were desperate enough to start names like Blake Bortles or Case Keenum, you didn't even get that. And of course, Alex Smith was a bust of his own kind on the 33rd anniversary of Joe Theismann's injury. Get well soon. It was a good week for runners again, and rookie sensation Saquon Barkley led the way with over 150 yards and 3 TDs. Ezekiel Elliot also had a monster game with a TD and over 200 combined yards as he starts to get heavily involved in the passing game. Three RBBC guys stepped forward with 2 TDs and over a hundred combined yards, so well done Philip Lindsay, Mark Ingram, and Aaron Jones. James Conner was the big stud disappointment for Week 11. He was held under 50 yards combined and dropped several passes, including what would have been an easy game winning TD. Dalvin Cook was a complete bust. He turned 12 touches into only 10 yards and was barely involved. Dion Lewis and Derrick Henry also disappointed. Henry we are used to, but Lewis only had 11 touches for 32 yards. On Reggie Wayne day in Indianapolis, it was T.Y. Hilton who was the star WR of the week with 9 catches for 155 yards and 2 TDs. A pair of rookies had breakout days around the league as Carolina's D.J. Moore and New Orleans's Tre'Quan Smith had identical 157 yard days with a TD for each. 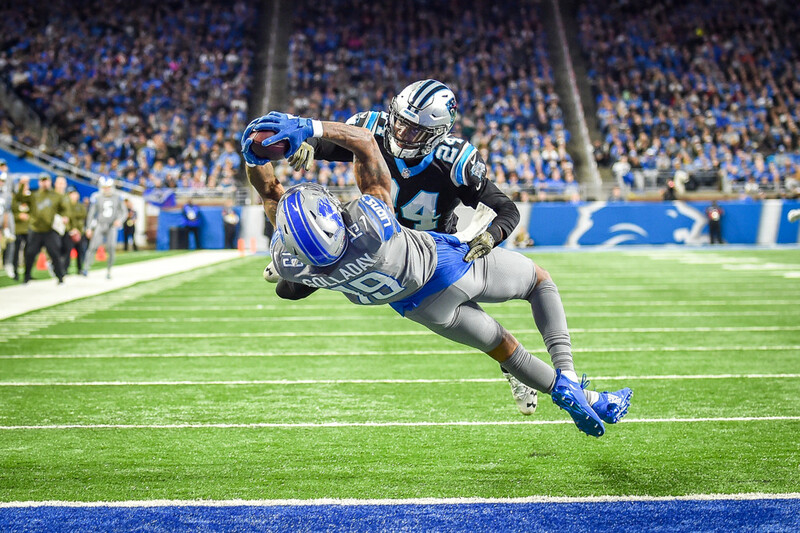 Kenny Golladay joined usual studs Julio Jones, Antonio Brown, Stefon Diggs, and Mike Evans with over 110 yards and a TD. Davante Adams didn't find the endzone for only the third time this season, but his 10 catches for 166 yards more than made up for it. Demaryius Thomas was a huge disappointment, held without a catch after spending the bye week with his new teammates. Baltimore spent all day running and left John Brown and Michael Crabtree with just 1 catch each for a combined 20 yards. Other names that disappointed were Alshon Jeffery, Devin Funchess, Corey Davis, and Sterling Shepard, each under 40 yards. Today's stud tight ends were Antonio Gates and Jordan Reed. Wait, what year is this?! On a light day for tight ends, Reed and Gates each found the end zone and cleared 70 yards. Last week's stud tight ends fell back to earth in a big way. Zach Ertz had just 2 catches for 15 yards, and Eric Ebron didn't get a single touch. Kyle Rudolph and Trey Burton also disappointed Sunday night.